Karcher K 5.540 2000 PSI 1.4 GPM Electric Pressure Washer is one of the best pressure washers available in the market for residential uses. An electric pressure washer always creates less water pressure than a gas run pressure washer. 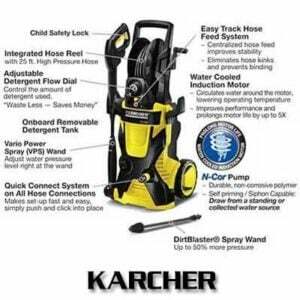 But in this product Karcher tried to put much power and tried to give you a feel of the gas run pressure washer. It provides 2000 PSI of water pressure along with 1.4 GPM water flow. These are the average features of a gas run pressure washer. You will get a DirtBlaster spray wand that costs $30 and a Vario Power Spray (VPS) wand . They will help you to switch quickly from detergent to high-pressure spray. With the pro-style spray gun, you can easily and effectively clean everything with great comfort. 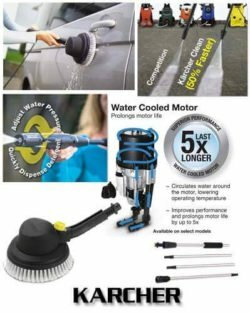 Karcher is the Company that gives you the power, strength, and durability with a very low price so that you don’t have to think much about your budget before you make the purchase. Karcher K 5.540 2000 PSI 1.4 GPM Electric Pressure Washer is featured with a water-cooled induction motor. It serves an optimum performance and longer life. It is Karcher that provides the advanced combination of water-cooled technology. The powerful motor generates 2000 PSI of water pressure and the pump serves 1.4 GPM of water flow. A DirtBlaster spray wand and a Vario Power Spray (VPS) wand are given extra with the device for handling the tough jobs. The spray wand also allows you to adjust the pressure right from the wand for your convenient use. It has an integrated detergent tank to carry the detergent freely. The onboard storages help you to keep all the instruments such as spray gun, spray wand, hose, power cord etc. in a proper and compact way. It has a 25-foot long high-pressure hose and a long power cord. The total weight of the product becomes 31 pounds and the attached two wheels kelp it in its free movement. The dimension of the machine is 16.5 x 15.5 x 23 inches which are not very large and doesn’t occupy much space in your garage. Strength: A good cleaning always depends on the water pressure that is provided by the machine since we use the water force for cleaning. 2000 PSI water pressure is good enough for doing all the cleaning work smoothly at your residence. With the different spray wands the power becomes double and effective that Karcher K 5.540 Electric Pressure Washer provides. Detergent Tank: An integrated detergent tank means relief from the extra burden of carrying a bucket of detergent when you are in your cleaning business. With the detergent tank, it becomes easier to apply the detergent when you require it. On-Board Storage: If you care about making your machine look tidy you need a good onboard storage for keeping all the instruments properly. The device has a proper place for keeping the spray gun, reeling the HP hose and keeping the power cord. Warranty: The device protects your valuable investment by providing you a one year of bumper-to-bumper warranty. So don’t take any tension for its technical problem or defect in the parts. Few users find a little difficult to use it as there is a risk of tipping the machine over because the hose reel is placed at the top. In some cases, some users have found leakages from the plastic hose connector. If you want a permanent solution for this problem then you just have to replace the plastic hose connector with a metal hose connector. Karcher K 5.540 2000 PSI 1.4 GPM Electric Pressure Washer is one of the best electric pressure washers available in the market. it gained the faith and goodwill from its users by delivering them good service over a long period of time. 2000 PSI water pressure with 1.4 GPM water flow can do any tough cleaning job in your house and keep it clean. The pro-style spray gun perfectly combines with the two different expert spray wands and gives you the best performance. If you are conscious about your investment than you can purchase this product without any hesitation. It will be one of your best investments. The device gives proper value to your money. It will always stay with you in your cleaning job.